Research Kitchen has been founded by two engineers with a clear view on science, products and markets. They are dedicated to products with high added value that make a difference in daily life and strive to make these products available to people anywhere. Radex Innovation Centre, Delft, The Netherlands. Currently we are developing a new instrument to help visually impaired people to perceive the environment. As the product develops into maturity, we will provide more detailed information on this site. For questions, feel free to contact us at info@researchkitchen.net. 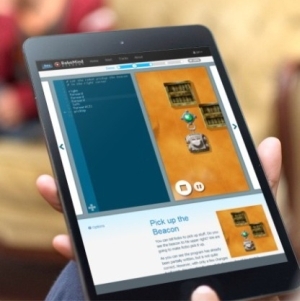 The fully integrated online tablet proof version of RoboMind. Here you can get started with programming right away. At home or at school, on any device, and anytime anywhere. Interactive challenges guide students and teachers through the courses. A virtual mentor validates solutions, helps with problems and guides students through the courseware. Students can thus gain validated Computational Thinking diplomas. At the Research Kitchen, we bring together the newest technologies, algorithms and software solutions (the ingredients) to create high-tech applications that matter. In other words: cooking with science to create results that make a difference in daily life. We extend the senses for the visually impaired and provide educational tools for the younger. We have an extensive track record in automating complex tasks by applying and extending algorithms from computer vision, pattern recognition and machine learning. We develop interactive physical systems including the necessary software and hardware. For instance in projects which extend the senses for better awareness and decision support. We are the creators of RoboMind, a unique and successful product which is used worldwide to motivate young students to choose a technical career. By car: A13 Rotterdam – Den Haag, exit Delft Zuid, TU campus, go left to the Schoemakerstraat and continue the road to the right (Watermanweg). At the first crossing go left, at the next go right (Kluyverweg). Just before the end of this road turn left following the Radex signs . By public transport: Go by train to Delft Central Station, take bus 129 direction Rotterdam/HLO (leaves every half hour). Step off at the HLO stop. Cross the road and follow Radex signs.